This postcard was an inexpensive production. 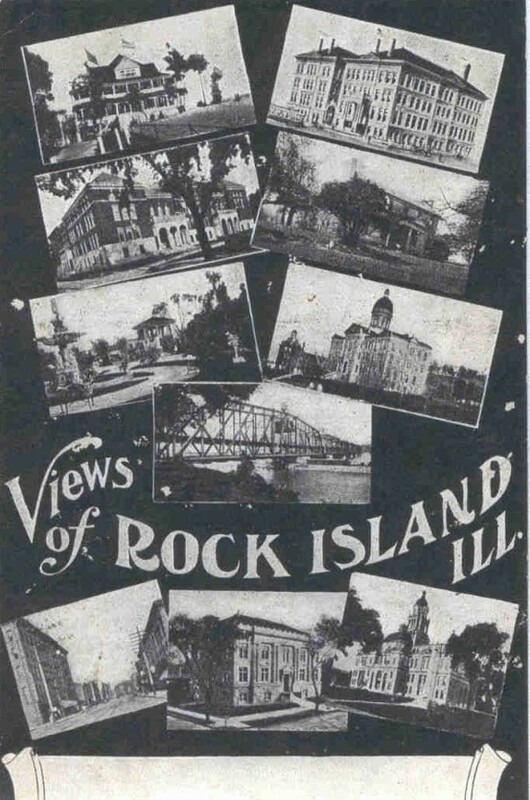 The publisher simply compiled miniature black-and-white versions of other Rock Island postcards. One can assume this was a bargain for the purchaser as well, who received ten different pictures for the price of a single postcard. The selection indicates which buildings and structures were considered interesting, important or salable around 1910. Not surprisingly, they still have the power to capture our interest. Moving from left to right, top to bottom, here’s what is there. At the top left is the second Watch Tower Inn that replaced the first inn that burned in 1896. This inn, with wide, two-story encircling porches, lasted 20 years until it too was destroyed by fire in 1916. The home office of the Modern Woodmen of America on Third Avenue at 15th Street is at the top right. The corner building was completed in 1898, and the large east wing was added in 1904. The photo shows these two portions of the building separated by an open courtyard which was later enclosed. It is currently used as the County Office Building. The next building is the fourth Rock Island High School, built in 1902 on the southeast corner of 6th Avenue and 21st Street, when the latter was still a through street. It served until the present high school was occupied in 1937. Later it became Central Junior High School but was burned in a fire set by vandals in 1949. The fourth picture shows the Federal style Colonel Davenport house on Arsenal Island lying in ruins. Pioneer settler George Davenport built his house in 1833, only to be killed there by bandits a dozen years later. During the Civil War, the house was used as headquarters for the nearby Confederate prison. Downtown’s Spencer Square is shown third down on the left, with the much-photographed Cable Fountain in the foreground. The full sized version of this postcard is featured in another postcard story. Old Main, the beloved icon of Augustana College is on the right. Completed in 1889, this Renaissance Revival styled building is one of many other college buildings described in a full-color walking tour booklet “Historical Highlights of Augustana College.” The tour book, which was published by the Rock Island Preservation Commission, is available free at the public library and City Hall. Near the center of the postcard is a steeply angled perspective view of the 1895 double-decker bridge near the western tip of Arsenal Island. It is built on the piers of an 1872 bridge, which itself replaced a nearby 1856 structure that was the first railroad bridge across the Mississippi. The three pictures across the bottom of our postcard show the Harper House hotel, the Public Library, and the County Courthouse, all individually featured in other postcard articles. In the story about the Rock Island Public Library, it was noted that its stone was particularly interesting. Although now yellow in color, it was originally “gray canyon stone” from a quarry in North Amherst, Ohio. The Courthouse used two different colors of Bedford, Indiana, limestone — blue at the foundation level and buff-colored above that. Why would a city that is named for rock, that is built on solid limestone import massive stones– not the most portable building material around – all the way from Ohio and Indiana? Why were the stones for many of our other buildings brought from equally distant spots? And how can we identify those stones? We asked Dr. Richard Anderson, Professor Emeritus of Geology at Augustana College for help. This article, by Diane Oestreich, is slightly modified from the original, which appeared in the Rock Island Argus and Moline Dispatch on June 15, 2003.